The next big thing is here. Samsung is finally out with Galaxy S4, the much awaited phone of this year. Now, just sit back and scroll through this article to get a glimpse of what happened during the entire event. 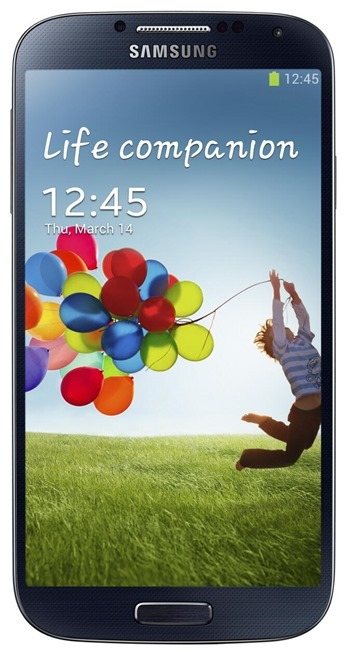 As predicted, the design for Samsung Galaxy S4 is inspired by it's Galaxy S III and Galaxy Note II. 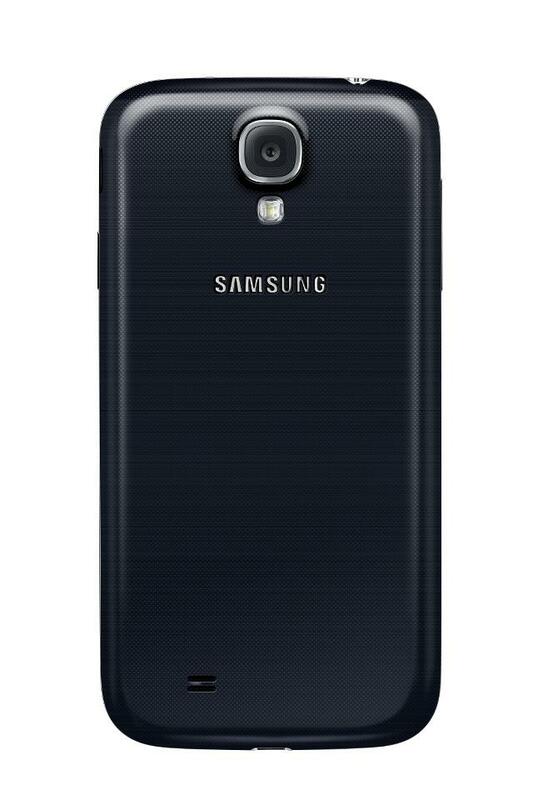 The device is thinner than Galaxy S III and is a bit more rectangular like S II. Like other Galaxy Handsets, Galaxy S4 is also made up of polycarbonate casing, but is still the best looking Galaxy till date. Owners of S III and Note II will surely be jealous of this. 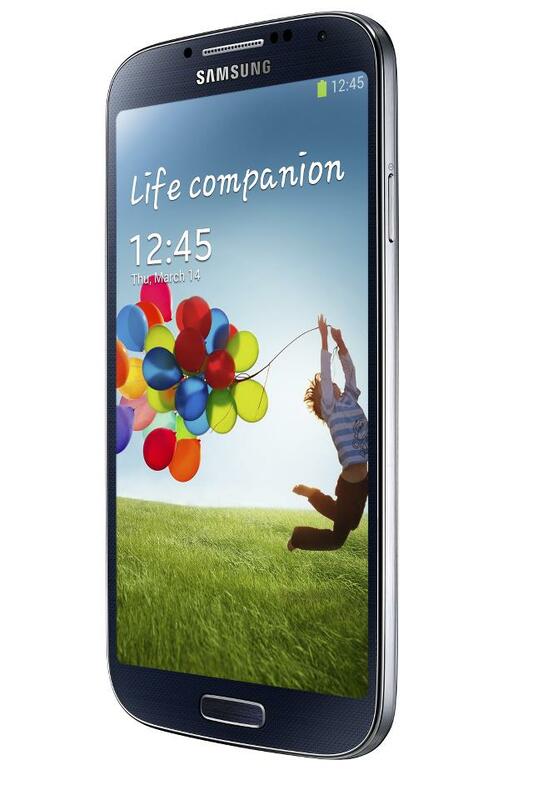 Weighing in just 130g and measuring at 69.8mm x 136.6mm x 7.9mm, Galaxy S4 is "Slimmer, lighter & Solid" than any other Galaxy. Samsung ditched the pebble blue and Galaxy S4 is now available in two colors - “White Frost” and “Black Mist”. 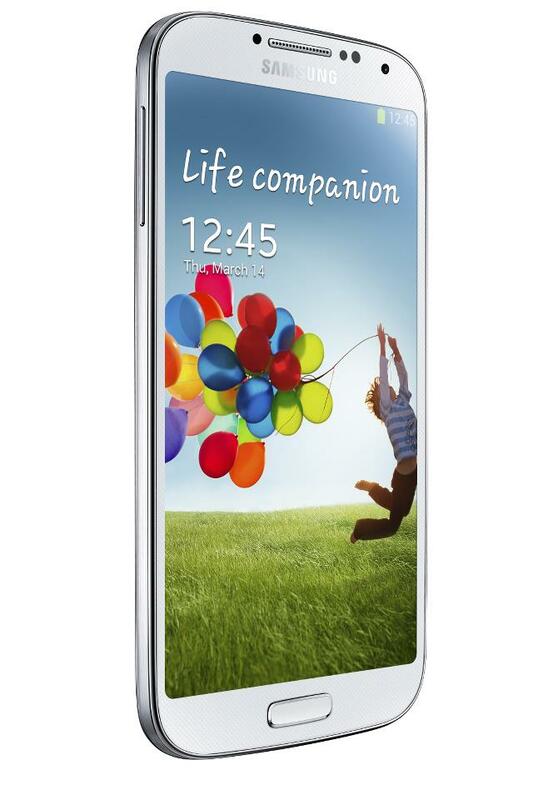 Samsung Galaxy S4 features a 5-inch Full HD Super AMOLED display producing a pixel density of 441 ppi. (Wow!!) The screen smartly adjusts the screen tone to match the surroundings for lesser eye strain. Samsung Galaxy S4 is powered by a 1.9 Ghz quad-core processor (1.6 Ghz Octa-core processor in some regions) and 2GB of LP DDR3 RAM. There are total 8 sensors on this device. - Smart Pause : Which let you pause the video when you look away from the screen. - Smart Scroll : lets you scroll through pages simply by titling your device. Samsung Galaxy S4 runs the latest Android 4.2.2 Jelly Bean with a slightly updated TouchWiz UI. 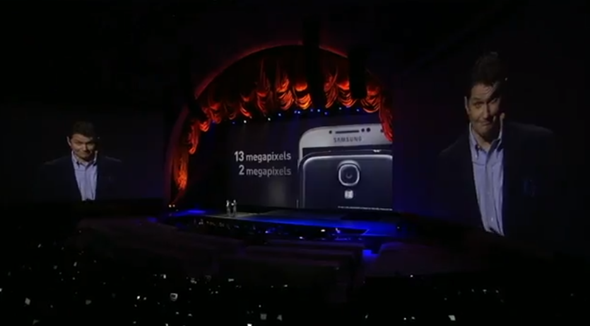 Like previous Galaxy Handsets, S4 come with three storage options, ie, 16, 32, 64 GB. All three can be expanded using microSD card upto 64GB. 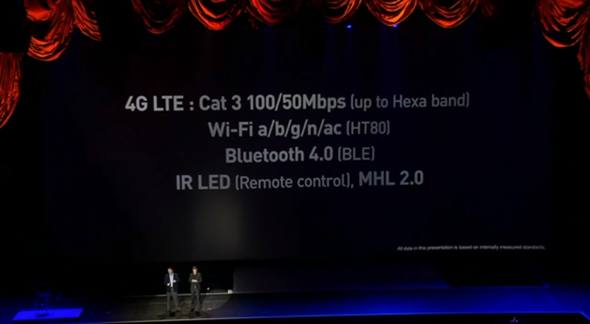 Galaxy S4 packs in 3G and 4G LTE models and WiFi offering a/b/g/n/ac (HT80). With 4G LTE, one can now download with a speed of up to 100 Mbps and upload speed of 50 Mbps. 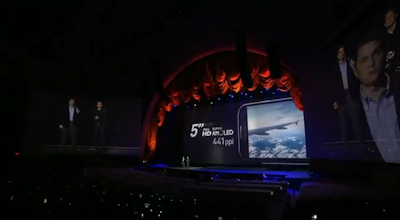 Apart from all above, S4 includes Bluetooth 4.0, NFC & GPS. As rumored, Galaxy S4 features a 13 MP primary camera and a 2 MP secondary camera. Camera's Drama Shot feature is capable of snapping 100 shots every 4 seconds. Both the cameras can be used at the same time. Samsung also introduced 'Sound and Shot', a new add-on which allows user to record five seconds of audio before clicking a shot. As Samsung says, “it’s like adding another dimension of detail to the memory you’re creating." 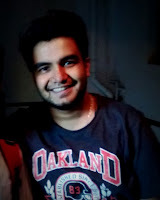 Other cool features include 'Eraser', which lets you remove people in pictures who might be “interrupting” your photo. Apart from all these, there are some standard smartphone features like HDR (High Dynamic Range) mode, panorama shot, sports mode, face detection. Samsung Galaxy S4 is powered by a massive 2600 mAh battery which will provide users with decent amount of battery life. - S Translator - lets you translate different languages and it's all VOICE. (Mind Blowing!!) It responds to 9 different languages. - Group Play - allows you to connect 8 S4 devices together with no wireless router required!! - Adapt Display - adjusts the volume and tone to an optimum level for user's comfort. - WatchON - transforms your smartphone into an IR remote, through which one can control TV, set-top box, DVD player etc. Samsung hasn't announced official pricing for S4 yet, but indicated that it will be around same as any previous flagship device. We are expecting it to be around ₹44,500. 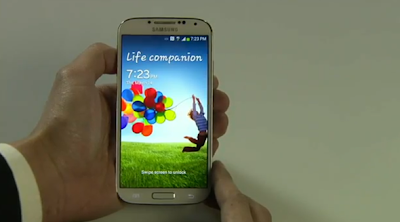 Galaxy S4 will be launching on 327 carriers in 155 countries, at the end of April 2013. Wow, wonderful blog format! How lengthy have you ever been running a blog for? you make running a blog glance easy. The whole glance of your website is fantastic, let alone the content!